Update: On Friday via one simple tweet, Donald Trump confirmed Indiana Gov. Mike Pence is his vice presidential running mate. Earlier: Just when it seemed things couldn't possibly become more divisive for the Donald Trump campaign, news broke from numerous sources that Trump's vice presidential nominee, was someone who is not only a staunch pro-life candidate, but a fierce gun rights advocate. 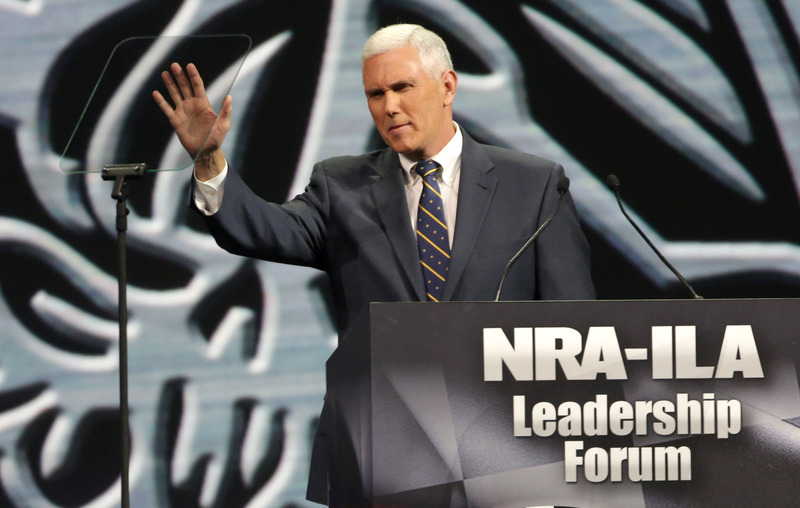 Mike Pence's stance on guns has awarded him some of the highest praise from the NRA, arguably the most prominent pro-gun organization around. Serving as governor of Indiana since 2013 and former Congressman from Indiana's 6th Congressional District from 2000-2012, Donald Trump will likely pick Pence for VP. Pence, who has branded himself a "Christian, a conservative and a Republican, in that order," isn't just a firebrand conservative. He received a rating of 0 percent from NARAL Pro-Choice America, an organization that works as an advocacy group for women's reproductive rights. He was also the subject of national scrutiny for signing into law a bill that placed more limits on Indiana women's ability to have abortions, most notably, outlawing abortions that were sought based on disability, race or gender. The legislation also put more restrictions on doctors and required funerary services for the aborted fetuses. But while he may have received quite a low rating from NARAL Pro-Choice America, on the flip-side, he has routinely received an extraordinarily high rating from the NRA — an A/A+ rating, to be clear. Such a high "grade" is reserved for those lawmakers who routinely vote or introduce legislation supporting and expanding gun ownership rights. Pence could have earned that rating for a number of reasons. In 2005, he voted for the Protection of Lawful Commerce in Arms Act (PLCAA), which halted lawsuits against firearms manufacturers. PLCAA has come under fire by gun control advocates who argue that the act grants too much immunity to gun manufacturers who make the purchasing of high-capacity assault weapons more accessible, such as the one used in the Sandy Hook Elementary school massacre, the Charleston church shooting, and the recent shooting in Orlando. Pence also co-sponsored the Firearms Interstate Commerce Reform Act, which would broaden the commercial rights of firearm dealers. The bill, which was introduced into the House last year, is also a pretty solid indicator that he would not be willing to negotiate with gun control advocates, who advocate for tighter restrictions on the gun shows. While Trump has not officially announced Gov. Mike Pence at the vice presidential candidate, numerous sources close to the campaign have confirmed that Pence will be on the running ticket. The announcement was set for Friday morning, but the Trump campaign has announced it will postponed due to the tragedy in Nice, France. Trump's decision to select Pence was likely done as an attempt to court more conservative voters who have questioned his stance on pro-life and LGBTQ rights. But bringing Pence, a hard-lined gun rights supporter, to the national stage is a dangerous reality for gun control advocates who will now have to contend with a GOP ticket that just got a whole lot redder.